Celtic brushed off an early red card to comfortably beat Alashkert and secure their place in the second qualifying round of the Champions League. Moussa Dembele's quick-fire double - the second of which was from the penalty spot - got Celtic off to a flying start, sandwiching a red card for Jozo Simunovic after a high tackle. James Forrest raced clear on the counter-attack to drill in a third. Alashkert rarely threatened and only fine goalkeeping denied Celtic more. One sour note for the hosts was striker Dembele limping off injured and manager Brendan Rodgers must now wait to learn if he will be fit for next week's tie against Rosenborg. A late goal from former Arsenal striker Nicklas Bendtner gave the Norwegian champions a 3-2 aggregate win over Valur, meaning Celtic face a rematch with the side they knocked out in the qualifiers last season. With a three-goal cushion from the first leg, Celtic were never likely to be troubled, but a blistering start ensured there would be no hope for the visitors. Dembele picked up the ball on the edge of the box and twisted and turned his way past the Alashkert defence before finishing low past Ognjen Cancarevic. But Celtic were reduced to 10 men just minutes later - Simunovic shown a straight red for a high challenge. Celtic continued to dominate regardless and doubled their lead when Odsonne Edouard surged into the box before being brought down. Dembele stepped up and sent Cancarevic the wrong way to leave the hosts coasting. 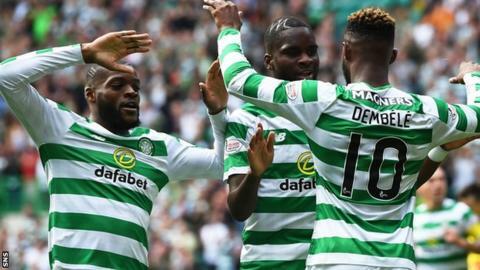 The two Frenchmen - Dembele and Edouard - continued to wreak havoc. Another powerful run by Dembele ended with Cancarevic denying Edouard from close range. From the resulting corner, Olivier Ntcham shot from the edge of the box, but Scott Brown stuck a leg out to put the ball over the bar from six yards. The Armenian champions struggled desperately to keep hold of the ball despite their numerical advantage, unable to get out of their own half as Celtic moved the ball comfortably. A long-range strike from Gagik Daghbashyan forced a decent save from Craig Gordon, but a counter-attack from the corner had Edouard sprinting through on goal before slipping in Forrest to calmly tuck the ball into the net. Kieran Tierney hit a delicious volley from 20 yards that Cancarevic tipped brilliantly over the crossbar, but Alashkert responded with their best move of the game. Artak Dashyan whipped a dangerous cross in from the left that substitute Mihran Manasyan missed by a matter of inches. Moments later, a deft pass from Artak Yedigaryan forced Gordon to race off his line and smother the ball, denying Manasyan a strike at goal. The pace of Edouard again caused problems at the other end as he skipped into the box, but he could not find the finish to beat the goalkeeper from a tight angle. Forrest, Callum McGregor and Ryan Christie all had chances as Celtic upped the pace despite being a man down. Despite a final flurry, Alashkert lacked the quality to cause the home side any real problems. Match ends, Celtic 3, Alashkert 0. Second Half ends, Celtic 3, Alashkert 0. Substitution, Alashkert. Cesar Romero replaces Jefferson. Substitution, Celtic. Ryan Christie replaces Moussa Dembele. Substitution, Celtic. Scott Sinclair replaces Odsonne Edouard. Substitution, Alashkert. Artem Simonyan replaces Danilo Sekulic. Mihran Manasyan (Alashkert) is shown the yellow card for a bad foul. Substitution, Alashkert. Mihran Manasyan replaces Uros Nenadovic. Second Half begins Celtic 3, Alashkert 0. First Half ends, Celtic 3, Alashkert 0. Goal! Celtic 3, Alashkert 0. James Forrest (Celtic) right footed shot from the centre of the box to the centre of the goal. Jefferson (Alashkert) is shown the yellow card for a bad foul. Goal! Celtic 2, Alashkert 0. Moussa Dembele (Celtic) converts the penalty with a right footed shot to the centre of the goal. Gagik Daghbashyan (Alashkert) is shown the yellow card for a bad foul. Jozo Simunovic (Celtic) is shown the red card for violent conduct. Goal! Celtic 1, Alashkert 0. Moussa Dembele (Celtic) right footed shot from the centre of the box to the high centre of the goal.